I’ve always been a huge fan of old movies (particularly the black-and-white ones) and even at a young age knew a great many of the movie stars’ names. My parents were always clued-up to ‘who was who’ in the classic films, and I probably gained my interest from them. The ‘Golden Age of Hollywood’ produced some of the best actors and actresses, in my opinion and my most favourite, Doris Day. Actors and actresses at that time seemed to have style, poise and above-all mystique. Many of the modern-day stars parade every aspect of their life in the glare of the media: marriage breakdowns, personal and emotional problems etc. There is no mystery about most of them, sadly. Quite a few years back, my Mother and younger sisters would constantly watch Doris Day movies and I would go and sulk in my room. As I grew a little older, I became a huge fan of Doris Day and in the early 1980’s I wrote a letter to this Hollywood legend, and sent it to her along with a portrait that I had done of her. To my utter delight and astonishment she wrote back! I don’t think there was anyone in that little terraced street that didn’t know my news by the end of the day. My correspondence with Doris Day took off over the years, much to the delight of a lovely lady in Stanley Post Office, who was also a big fan. I remember her chatting to me, whilst sticking the stamps on Doris Day’s letters with pride. The last letter I received from Miss Day was on 23 April 2012, when I had taken a day off work, to celebrate my patron saint’s day with an English ale in my English garden. After receiving this unexpected piece of mail, I could really say it was a ‘red-letter day’, as the sun was shining and all seemed well with the world. 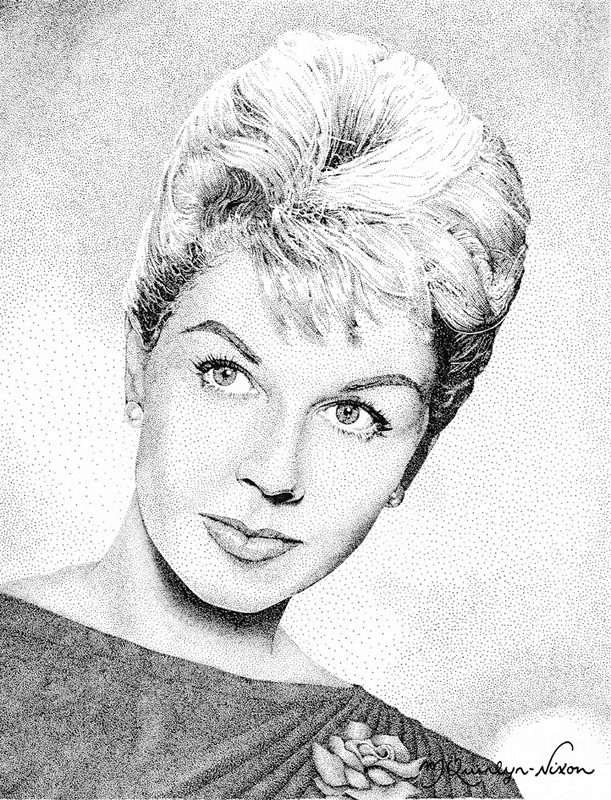 During the last thirty years, I have done numerous drawings of Doris Day, one of which was shown in a large exhibition in Liverpool, but most of them have been for my own pleasure. 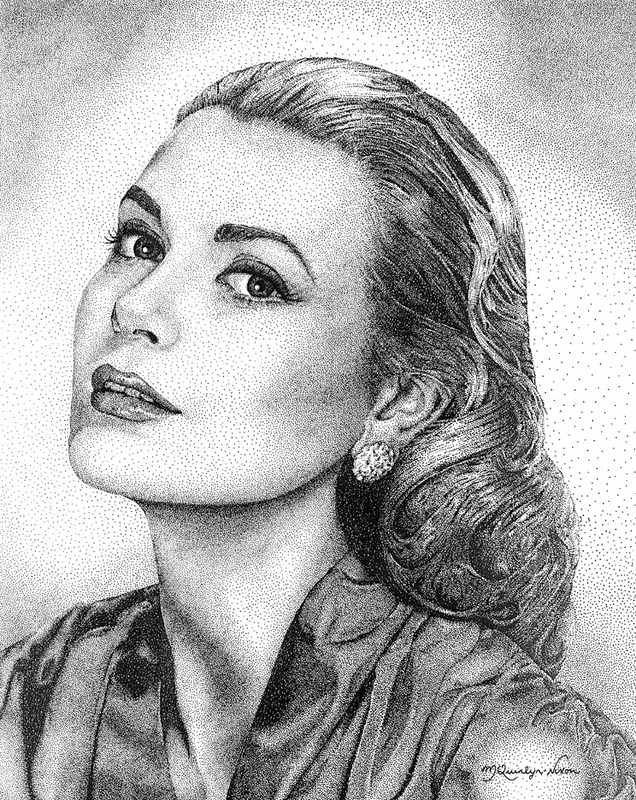 Some of these have been coloured-pencil or pastel sketches, but the majority have been done with a technique, known as pointillism (if you look at some of my earlier posts on Grace Kelly, Ingrid Bergman and Lauren Bacall, you will see more examples of this technique). I think my favourite movie of Doris Day’s has got to be ‘Pillow Talk’ (1959) in which she c0-starred, alongside her friend, Rock Hudson. The chemistry between the two characters, Brad and Jan, still amuses me to this day, along with Doris’ indignant expressions as she tries to reason about the best way of sharing a telephone party-line. But I also have a special memory of playing at my friend, Kae McNeil’s house when I was just a young boy. We were both heartily singing along to the Black The Hills Of Dakota, whilst her father, George, was trying to enjoy the movie ‘Calamity Jane’ (1953). Grace Kelly is arguably one of the most iconic of movie stars and still retains a magical quality that matched her later life as a princess. There is so much beauty in her face, which strangely combines both strength and vulnerability. The movie ‘Grace of Monaco’, starring Nicole Kidman, is released today and reminded me of a portrait that I had done of Grace Kelly ‘many moons ago’.